This luxurious resort, the latest addition to the Riu family in Playa del Carmen, is the ultimate in first-class accommodations and pampered service. 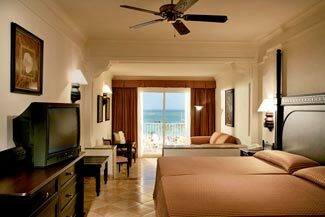 Rising along a spectacular stretch of white sandy beach and framed by tropical palm trees, this spectacular hotel boasts 400 elegant junior suites with hydro-massage bathtubs and all of Riu`s distinctive amenities. Enjoy the exquisite selection of a la carte restaurants and bars, along with continental breakfast room service, 24-hour All-Inclusive snacks and beverages, and the impressive exchange privileges program with all sister properties within the Riu Resort complex. 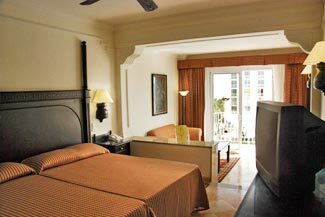 Same as Junior Suite Ocean View with 1 king size bed, larger split-level sitting area including sofa, walk-in closet and larger balcony. Bathroom with separate shower. Max occupancy: 3 adults or 2 adults + 1 child. All Junior Suites with Ocean View have air-conditioned, 2 double beds or 1 king size bed, FREE Wi-Fi, ceiling fan, satellite TV, phone, radio alarm clock, mini bar, liquor dispenser, complimentary in-room safe, iron & ironing board. Bathrooms equipped with hydro-massage tub, hairdryer and amenities kit. Balcony with Ocean View. All Junior Suites have split-level sitting area and sofa, some available with a sofa bed. Max occupancy: 2 adults + 2 children or 3 adults and 1 child. All Junior Suites with Jacuzzi and Ocean View have air-conditioned, 1 king size bed, FREE Wi-Fi, ceiling fan, satellite TV, phone, radio alarm clock, mini bar, liquor dispenser, complimentary in-room safe, iron & ironing board. Bathroom equipped with hydro-massage tub, hairdryer and amenities kit. Balcony or terrace with private jacuzzi, Ocean View. 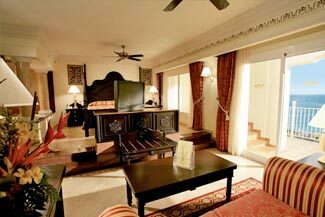 All Junior Suites Jacuzzi have split-level sitting area and sofa. All Junior Suites have air-conditioned, 2 double beds or 1 king size bed, FREE Wi-Fi, ceiling fan, satellite TV, phone, radio alarm clock, mini bar, liquor dispenser, complimentary in-room safe, iron & ironing board. Bathrooms equipped with hydro-massage tub, hairdryer and amenities kit. French balcony or balcony with partial Ocean View. All Junior Suites have split-level sitting area and sofa, some available with a sofa bed.